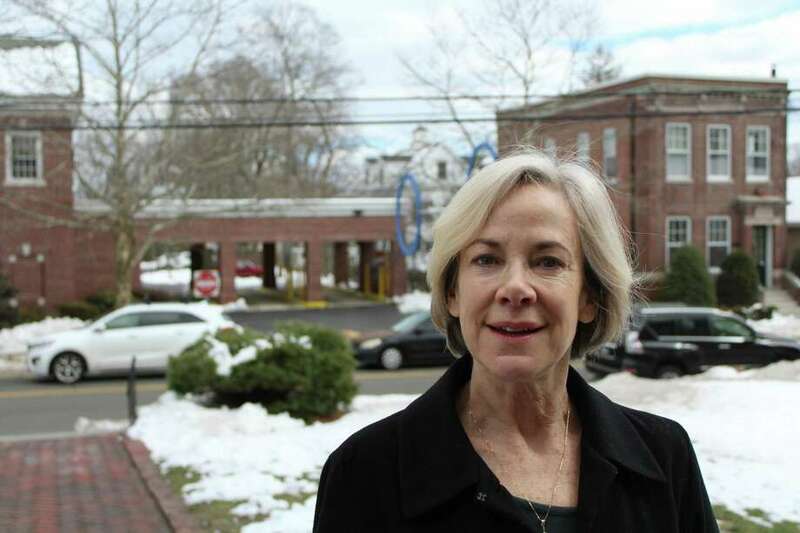 Janet Rathert, an award-winning actress and New Canaan resident. NEW CANAAN — Janet Rathert would prefer to act as someone else than present her work to professors, as she did when at Claremont Graduate University. “Acting is easier than public speaking. You’re not being yourself, you’re being a character. When I’m playing a character, it’s someone else,” Rathert said. Rathert recently returned to acting after a three-year hiatus with a supporting role in “White Guy on the Bus,” produced by the Square One Theatre Company in Stratford. She plays Roz, a teacher in an inner-city school. The show opened last Friday at Stratford Academy and concludes this weekend with performances Friday at 8 p.m., Saturday at 4 and 8 p.m. and Sunday at 2 p.m.
“White Guy on the Bus,” as it suggests, confronts racism, and Rathert hasn’t been one to shy away from addressing social issues through acting. While she is a resident of the predominantly white town of New Canaan, Rathert grew up in California. When she lived in Orange, Calif., Rathert took part in drama education and drama therapy as a way of helping others learn about — and cope with — traumatic experiences. Stratford Academy, 719 Birdseye St.
Friday at 8 p.m.; Saturday at 4 and 8 p.m.; and Sunday at 2 p.m. In preparation for that role, Rathert studied the work of Norwalk resident and renowned photojournalist Lynsey Addario, as well as interviews by other war correspondents. “One of the fun things about acting is that you have a reason to immerse yourself in some other type of life you normally wouldn’t experience,” Rathert said. Rathert has been acting for over 40 years, something she started as an elementary student. “I played the turkey in the Thanksgiving play,” Rathert said — and pursued in her 20s, though not without realizing the financial uncertainties acting entailed. “My parents weren’t really enthused about me acting. A professor encouraged me to pursue it and as I went about auditions, I saw it was a tough life. I got worried financially about acting and so I went to graduate school to become an English professor,” Rathert said. Though she worked in marketing briefly, Rathert said she never had a “head for numbers” and her passion for the arts and literature attests to that. She obtained her bachelor’s degree in history from the University of California Los Angeles. After studying at Claremont Graduate School, Rathert taught ancient and medieval literature at University of Connecticut at Stamford for a total of 13 years, retiring after the spring semester last year. “I miss teaching — kids are very optimistic and I was always enjoyed that. I miss being in contact with youth,” Rathert said. And though she has lived in New Canaan for a combined 16 years, Rathert is still a Californian at heart.